I’ve imparted to you lots of tips on How To Live For Free (if I do say so myself), but those savings can be undermined if you need to spend a lot of money on transport to put them into action. For Londoners especially, the cost of travelling around day to day can be steep. Not to fear; I’ve compiled some advice on how to save yourself money on your daily London commute. Unfortunately I can offer no help on how to avoid having your face jammed into a stranger’s armpit on a packed tube carriage. An Oyster card will always save you money on a single journey fare, whether it be on bus, train, DLR tube, tram or a combination. The same goes for several journeys in one day, as Oyster’s daily cap costs less than a one-day travelcard. This very handy Single Fare Finder on Transport For London (TFL)’s website allows you to input your start and destination to find out exactly how much one journey will cost you during peak and off-peak times. Using it to its greatest effect will allow you to work out a cheaper commute. TFL’s Single Fare Finder shows you the cost of a single journey on London transport with an Oyster or with cash. Use it to customise your route and save money on travelling. However, if you’re using London transport several times a day for a week, a seven-day travelcard (which you can easily purchase from stations, visitor centres and newsagents) may save you money. The Oyster card doesn’t have a weekly cap so using it for a week costs the sum of the daily costs. Boris Johnson has said that weekly Oyster capping will be introduced in 2015. Currently (July 2014), if you travel through zones 1-6 on your Oyster at peak times the price will cap at £15.80 for the day. Do this five times in the week and you’ll pay a total of £79, but buy a 7-day travelcard and you’ll only pay £57.20, saving yourself a not-too-shabby £21.80. There are monthly and annual travel cards too, facilitating even more of a saving. It can be a little tricky to work out the best option when you consider all the differently priced zones and whether you’re travelling peak or off-peak. For the best of both worlds, you can add a travelcard onto your Oyster. That way, the clever ticketing system will work out which of the two to use to give you the cheapest fare. If, for instance, you mainly but not exclusively travel around central London, you could add a seven-day zones 1-2 travelcard to your Oyster card and make sure you have some pay-as-you-go Oyster credit on there too. The ticketing system would see that you are covered for your travel while in zones 1-2, but when you venture into other zones your Oyster credit would be used to pay for that section of your journey and would be cheaper than paying with cash or buying a separate one-day travelcard. Travelling in a group of ten or more? You can save money with the Group Day ticket, valid on DLR, the Underground and some rail journeys. Each member of the group is issued a paper ticket which must be booked from a ticket machine or ticket office at a station. You have to stay together while travelling so make sure you pick nine other people you actually like. Students can get a 30% discount on pay-as-you-go Oyster travel with the 18+ Student Oyster photocard. Take a look at the terms here. The elderly and the eligible disabled who reside in London can take advantage of the Freedom Pass which allows free travel on buses and the Underground. More information can be found here. 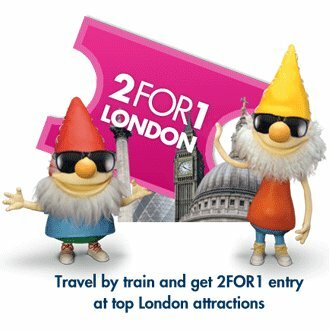 We all like to save money on travel but we certainly wouldn’t say no to the added bonus of 2 for 1 tourist attractions. Check out Days Out Guide to discover the discounted attractions you can visit when travelling on a National Rail ticket, such as London Zoo and theatre shows. You’ll need to book your tickets in advance along with a valid train journey. This deal is not valid with Oyster. Not many London tube commuters are aware that they are eligible for compensation from TFL when they experience a delay of over 15 minutes, provided the cause of delay was within TFL’s control. This compensation can be obtained by filling out a form and sending it to TFL. Claim My Refund, an innovation by Devin Smith, bypasses the form-filling by automatically scanning your Oyster journey history and applying for the refund on your behalf where applicable. All the hassle is taken care of for you. There are TFL figures to show that millions of refunds for tube delays have gone unclaimed in past years. It’s free to join Claim My Refund until you get your first TFL refund. After that you’re charged at £1.99 a year. Just head to their website and fill in your details to register for an account. With a little savvy planning, it’s easy to save money on travel. But where to go? Take a look at our posts on How To See Cinema For Free to plan your day out. Need some commute reading? How to Live for Free is available to pre-order now and is chock-full of indispensable advice on living the good life without spending.